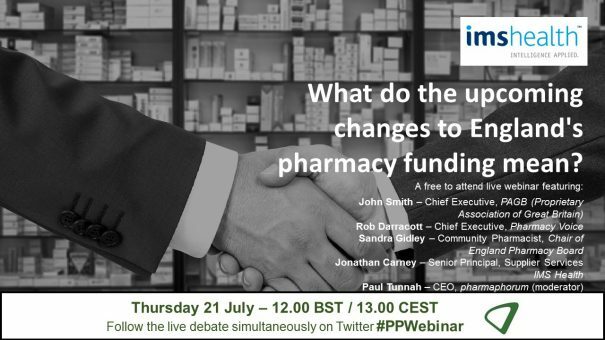 Available on demand: What do the upcoming changes to England's pharmacy funding mean? New measures proposed by the Government will impact community pharmacies across the UK; the biggest change of this nature in decades. The impact will go beyond community pharmacies as other stakeholders also feel the pressure. UK pharmacies already support more inhabitants per pharmacy than other major European markets; how will this funding change impact how patients are cared for in the community? How will pharmacy suppliers, such as consumer health companies, operate in the increasingly cost constrained and competitive environment? IMS hosted an interactive webinar to share market insight on the potential impact and a live discussion with critical stakeholders of this change. Hear directly from key stakeholders about their thoughts of how the changes will play out, and what this means for you in your sector. The live webinar took place on Thursday 21 July at 12.00 BST / 13.00 CEST. To view the on-demand version, please click here or on the button above/below. Jonathan is a Senior Principal within the Supplier Services. He has a wealth of experience in the Commercial Effectiveness arena having led various projects including resource optimization, sales force sizing, targeting & segmentation, and incentive compensation management. With over twenty years of experience working in the industry Jonathan has a strong background in business operations in the pharmaceutical industry. He has worked for over 12 years in pharmaceutical companies in roles ranging from sales representative to Business Information Manager and Associate Director SFE Europe, so has a deep understanding of client situations and constraints. The remainder of his career has been in consulting, working with most of the top pharmaceutical and biotech companies. Jonathan holds an MBA from Warwick Business School. John Smith joined PAGB as Chief Executive in July 2015. Rob Darracott has worked in the NHS and Department of Health and spent 8 years with Alliance UniChem, working in the UK and in Europe. He joined the Company Chemists’ Association as its Chief Executive in 2007, and added leadership of the joint representative activities of Pharmacy Voice in 2010. Since 1st September, he has been the full-time CEO of Pharmacy Voice. Rob was co-chair of the Modernising Pharmacy Careers Programme Board’s review of the professional training of pharmacists and of Department of Health’s Steering Group on Improving the Use of Medicines. He was appointed an Honorary Professor in the School of Pharmacy at the University of Nottingham in 2013 and is a member of Public Health England’s Blood Pressure System Leadership Board. Sandra spent 21 years as a community pharmacist, working mainly in the locum and supermarket sectors. From 2000 to 2010 she was Liberal Democrat and MP for Romsey. During this time she held posts with shadow ministerial responsibility for health (social care, public health, long-term conditions) and equality. She was also a member of the Health Select Committee for four years. 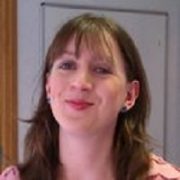 Since 2011 she has worked as a community pharmacist with occasional consultancy.